Monarch Air Group provides private air charter in Pomona, CA. Our clients benefit from top-notch service, unrelenting dedication to safety, wide selection of aircraft, and years of experience in chartering private jets. To obtain a free quote, please use our online quoting tool provided below, or call toll free 1-877-281-3051. Monarch Air Group provides private jet charter flights in and out of Pomona, California, USA. Situated east of Los Angeles, Pomona is the 7th largest city in Los Angeles County. The population of the city is about 149,058 people, and the total area is 22.964 square miles. Throughout a year Pomona hosts the Classic Car Show, the Pomona Swap Meet, the L.A. County Fair, and some other events. The most popular tourist attractions include Wally Parks NHRA Motorsports Museum, Second Street Promenade, American Museum of Ceramic Art, and much more. The nearest airports are LA/Ontario International Airport (ONT / KONT), which is located 9 miles from the city, John Wayne Airport (SNA / KSNA), which is located 33 miles from Pomona, Long Beach Airport (LGB / KLGB), which is situated 42 miles from Pomona, Bob Hope Airport (BUR / KBUR), which is situated 44 miles from the city, and Los Angeles International Airport (LAX / KLAX), which is situated 46 miles from Pomona. 13. EDW, Edwards AFB, Edwards AFB, United States. 14. EMT, El Monte, El Monte, United States. 15. 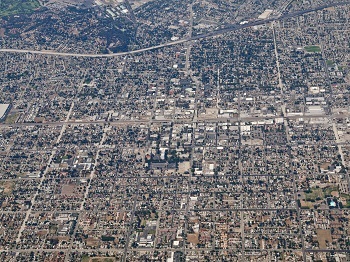 FUL, Municipal, Fullerton, United States. 16. HHR, Hawthorne, Hawthorne, United States. 17. HMT, Ryan Field, Hemet, United States. 18. JBP, Commerce Bus. Plaza, Los Angeles, United States. 19. JDY, Heliport, Downey, United States. 20. JGX, Heliport, Glendale, United States. 1. Sheraton Fairplex Hotel & Conference Center, 601 West McKinley Avenue, Pomona. 2. Sheraton Fairplex Hotel & Conference Center, 601 West McKinley Avenue, Pomona. 3. Sheraton Fairplex Hotel & Conference Center, 601 West McKinley Avenue, Pomona. 4. Sheraton Fairplex Hotel & Conference Center, 601 West McKinley Avenue, Pomona.